There are some things, many things, I cannot wrap my mind around. I had found myself in western Uganda. Yes, I hadn’t exactly planned this, but my internship work sent me. The same day I was told it would be good to visit the forestry college in Masindi district, I was on a bus to the region bordering Lake Albert and the DRC. In the dark, I was shown into a room, and left for myself until the morning. What appeared to be a flying worm buzzed near the light and I shivered, trying as hard as possible not to be squeamish but, failing, retreated under the covers beneath the mosquito net. Morning came and I had no water with which to shower. By now, this was not a surprise nor, usually, an annoyance. It was an acceptance. I put on sunscreen and stepped out into the greenery to be swept away. Much of my time interning in East Africa passed thus: I let myself be carried along. There was no way for me to plan. It was hard to get information. It was trying, very trying sometimes, to understand what was even going on. So, I cultivated patience and an adventurous streak. Masindi district today? Alright, meet you for the bus this afternoon. So, now I was on a bus with college students who had been in the area for a month. We were driving to a village to interview people who worked on a collaborative forest management project. Here’s the very simplistic gist of it. This district is very rural, and very poor. 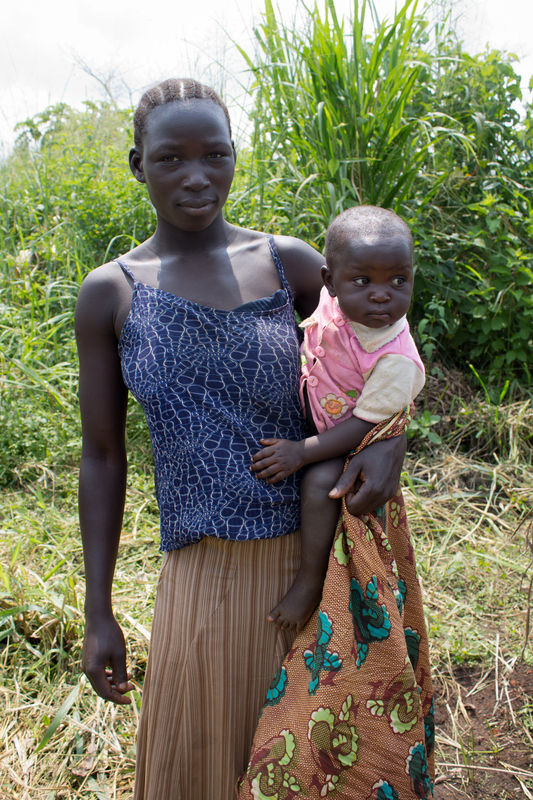 It also is home to refugees from the DRC, who fled the decades-long conflict there. The economy is largely based on agriculture. There are beautiful forests around too, with precious trees like mahogany, and chimpanzees who live in the green shadows. There are forest products worth money, and they are often illegally and unsustainably harvested. This community had formed a group to protect the forest, border planting around it, patrolling it, and even creating apiaries. Some of the college students chatted with me, and one in particular stuck with me, very kindly so, I must say. I never quite grasped a full understanding of what was going on around me between the heavily accented English and the other languages circling around during the meeting. She translated generally what was happening. I sat back and just watched. We made it to a farm and met with a group of people, and again, another girl latched herself to me—this time a villager, not a student. She was very sweet and quite taken with my name, repeating it to me in a sing-song manner: Leah, Leah. We fumbled words between us, talking as best we good. She held a baby on her back. Where’s yours, she asked. I have none. But how old are you? At the time, we were about the same age: she, 20, I, 21. Do you have brothers and sisters, she asked. Yes, two. So few? Will you take my baby to London, she asked. I can’t. I don’t live in London. I’m sorry. That’s as far as we got before language and experience built an insurmountable wall, marking the end of our hour together. I had to go with the students anyway. I knew I would never see her again. Her life would trail off in a vastly, vastly different way from mine. In a way that I simply cannot, cannot understand. She doesn’t get my life. I don’t get hers. I’m sorry, sister. That afternoon, I went to the market with one of the teachers. I wanted to leave as soon as we arrived. I stepped into the aisle and a man grabbed me, hard. I wrenched away, furious, and continued walking, not looking, not making eye contact. I was scared. I didn’t understand well how the market functioned. I didn’t understand how I, white as can be, could navigate through the bustle without being handled again. I didn’t understand how I could even look at a blanket of goods, spread on the ground, covered in items I did not need nor could carry, without sparking false hope in vendors’ eyes. I did not know how to communicate anything well. I shied away. Eventually, we left. 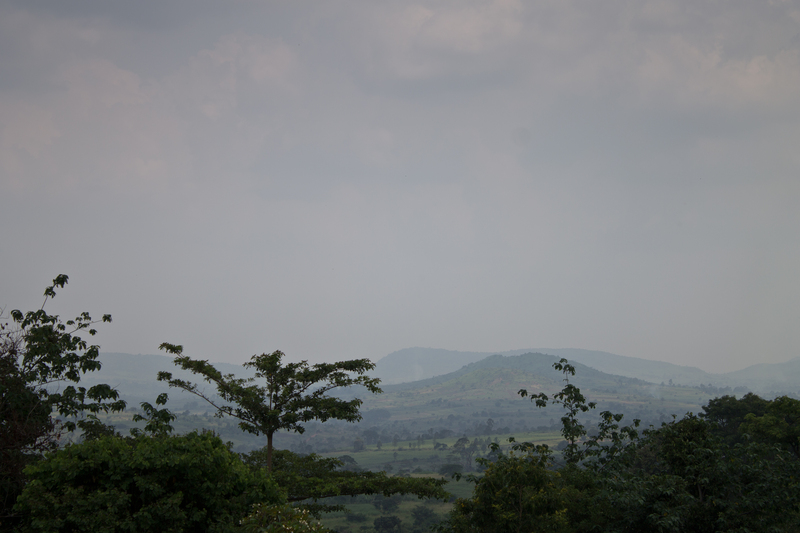 The next day I was taken to Budongo forest, riding on a truck that was picking up food for the students at the college. We chugged down the road known as the Royal Mile when I saw a person run across the way. No, a chimpanzee. I got out of the truck, nervously, and with my camera walked slowly in front. Chimps ran around beside the road, the younger ones curious, the older ones displaying, banging on trees. They were very large. I avoided looking directly at them, which could provoke. I buzzed with a nervous thrill. While the chimps’ strength was unmistakable even from afar—they could crush me—here I was, walking with chimps, remembering my childhood idol Jane Goodall. The chimps followed for awhile, and then went back to their own activities. I was dropped at a field station, managed by the Jane Goodall Institute, hosting primatologists, where I spoke with a couple of Brits who were working there. They fed me some tea and I overstayed, the truck waiting for me outside, for I was clinging to conversation, to a situation, that I could easily grasp, that my mind bent around no problem. But back in the truck, driving along, we passed by huts, children whose malnutrition was apparent playing outside. I shrunk away from the window sometimes as eyes searched me out. I’m sorry, I really, really, don’t understand. Back at the college grounds, we passed by a woman who had earlier been looking for the clinic, lying in the grass, just lying there. I pointed her out to the teacher: tell someone, we should get the doctor, can you call someone? Oh, he told me, she just has malaria and the doctor will come. I just had to drift along, trying to understand, but failing. your wording is really strong, under the guise of being unsure. you really get across your feeling of foreign terror, and not knowing what to do about it. as always, I watch for your work. Thanks so much for the support! I’m always happy to hear I managed to convey my feelings. I like your style of writing. It’s very direct but still manages to convey your emotions. I definitely felt your uncertainty and nervousness. Thank you so much. I’m glad my message got through to you. Thanks for reading! I can really relate to your story. I was in Uganda myself, and working with development. I have also lived for longer time in Nigeria, and visited many other African countries. I can therefore also related well to your feelings. Yeah, I’m sure you’ve had similar experiences, Hanne. I knew you were in Nigeria, but where did you go in Uganda? I was just in Kampala and Masindi district for my graduate school internship, and those weren’t long visits. The internship was primarily based near Nairobi so I mostly was working in Kenya. I always wanted to visit Kenya. Amazing about your projects! When did you begin them? I was there back in 2011. About 1 and a half year ago. But I was there for christmas four years ago. Wow what a powerful story. Thank you! As for what happened next – mostly a series of delayed and uncomfortable bus rides, haha. Maybe I’ll write more about them later, but in this blog I tend not to be chronological. :) Traveling to third world countries can be highly disconcerting and very rewarding at the same time. But life in general can be like that too. Did you get blindsided by any happiness? Yeah, it is a point that I think can point to sadness, but also patience and understanding, at once. In the case of I and her – we didn’t have time, or adequate shared language at that moment, to communicate very steadily, to teach each other about our lives. And of course, they are so vastly different that I don’t think that chasm can be totally bridged. That’s sad but also normal – I mean, no one completely can understand another’s life, since they don’t have the exact same shared experiences. And in our cases, our shared experiences and situations were basically none. Beautiful photography. Reads and looks like something straight out of a travel magazine! “I would never see her again. Her life would trail off in a vastly, vastly different way from mine.” I’ve been going on missionary trips for about ten years now, and this I can relate to. Sad in a way, but incredibly true. I love your wording and the way you express yourself, I just started my blog which is in no way similar to yours, but if you decide to stop by, it would be an honor. Thanks for the very kind comment. Sad but true indeed. Best of luck with your blog!